Fit and flare dresses are everywhere and everything this summer. There are many reasons that this silhouette is so popular and has made its way into everyone’s closets. The first being that it is flattering for all body types. The tight to exaggerated lines of the dress give the illusion of a pin up figure. The silhouette is also fun and flirty, and because of the fullness of the skirt the hemlines tend to be longer making it appropriate for all occasions. I wore the dress featured in this post to a bridal shower (these pics were taken after the bridal shower) and also wear it work all the time. I hesitate to call this flattering and retro shape a trend, because in reality it is more of a wardrobe staple that should be in everyones closets. 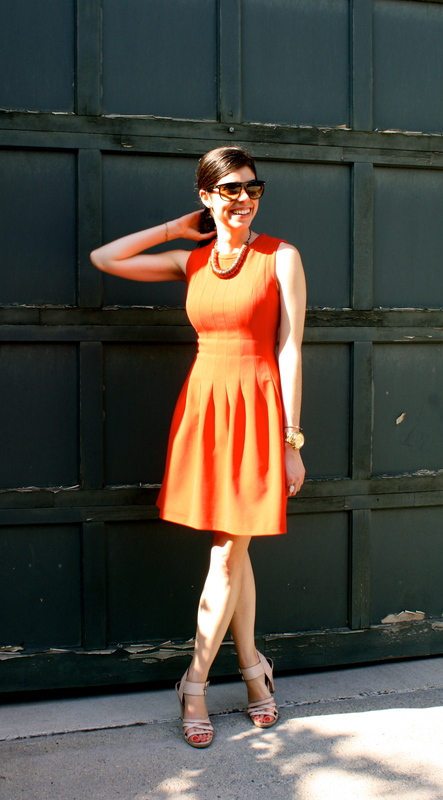 The key to a successful fit & flare dress is in the name, fit! Make sure it is tight enough on top so the flare is more drastic. Try bold colors and prints for the summer. The flare is perfect for hot summer days!